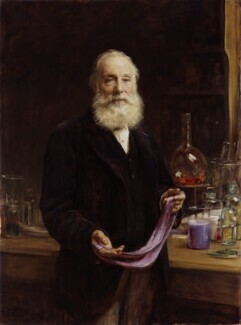 In 1856, while still a student at the Royal College of Chemistry, Perkin discovered a process for creating the first ever coal-tar dye, a purple, later to be named 'mauve'. 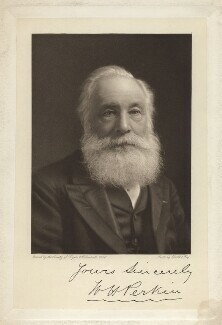 This discovery, and Perkin's continued research into the dying process, eventually led to the displacement of natural by artificial or synthetic dyestuffs in the textile industry. In 1870 Perkin opened a plant for the manufacture of a synthetic alizarin, which replaced the widely used red dye, derived from the madder plant. His contribution to science and industry was recognised internationally during his lifetime, receiving nine honorary degrees, and knighthood and several medals of achievement.